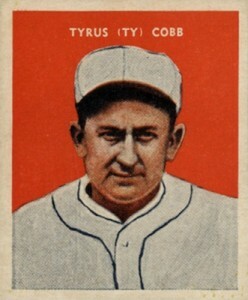 Tyrus "Ty" Cobb, the greatest base hitter the sport has ever seen, is also one of the major figures in tobacco era trading cards. This top list chronicles the very best in Ty Cobb baseball cards, including appearances from the turn of the century through 1933, and features some of the most iconic cards from the early days of the hobby. Shop for Professionally Graded Ty Cobb Cards on eBay. Born in rural Georgia, Cobb was given the nickname the "Georgia Peach" despite his reputation as having a tough-as-nails personality. 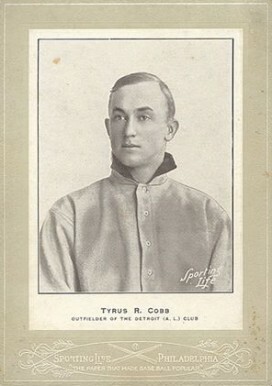 Cobb spent nearly his entire career with the Detroit Tigers and, in the process, totaled an incredible amount of baseball records. Most famously, Cobb was the all-time hit leader for decades until Pete Rose surpassed him in 1985. At the time he retired, he was also the overall leader in games played, runs, and stolen bases. Cobb is still the career batting average leader with an amazing .366. 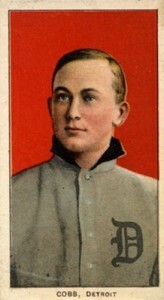 Although Ty Cobb never won a World Series title, his Tigers teams went to the World Series three consecutive seasons in 1907, 1908, and 1909. That last year saw Cobb win the Triple Crown with a .377 batting average, 107 RBIs, and nine home runs. All the cards listed on this list date from 1933 and earlier, meaning most are out of reach for the normal budget-minded collector. However, Cobb's legendary status has resulted in his inclusion in many sets issued after his retirement. Among these are some very accessible appearances from the 1960s in 1960 Fleer, 1961 Fleer Baseball Greats, and 1963 Bazooka All-Time Greats. 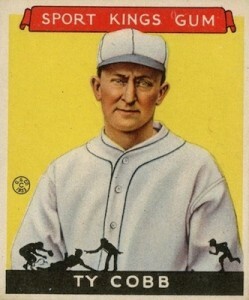 As he was the all-time hit leader for some time, Ty Cobb was also frequently honored in Topps sets. You can find Ty Cobb cards in 1973 Topps, 1976 Topps, and 1979 Topps. Of course, there plenty of modern options as well, including premium cards that feature cut signature or game-used memorabilia pieces. 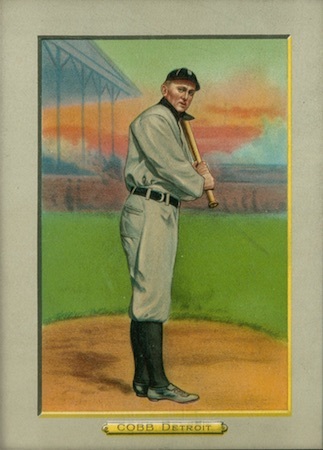 In constructing this top list, the historical importance of each card along with card value and design were all considered to create a comprehensive list of the greatest Ty Cobb Cobb cards. 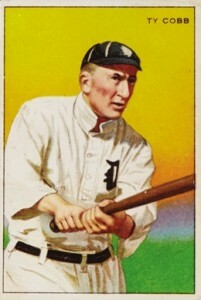 Are there any other Ty Cobb cards that deserve a spot on the list? Let us know in the comments. The checklist of the 1933 U.S. Caramel set includes 32 athletes with 27 of them being baseball stars. 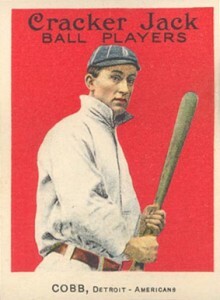 The cards were issued as a redemption contest to receive a ball and glove and and many examples of the cards were "cancelled" after being redeemed. Cobb's card is one of the top options in terms of value, right behind New York Yankees' sluggers Lou Gehrig and Babe Ruth. Cobb was given the premiere spot on the 1933 Goudey Sport Kings set checklist and I think that speaks to what Cobb's reputation was at the time. Although he would take a step back as baseball fans fell in love with home run hitters, he was already considered one of the best baseball player to ever lace up his cleats when this set was issued. 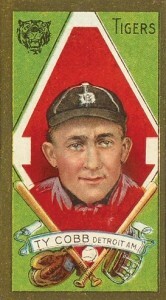 Ty Cobb is the centerpiece of T227, which has been given the title "Series of Champions." The 1912 set included many athletes from various sports, including four baseball players. Like many cards from this era, the reverse side offers advertisements for tobacco brands. The was the only opportunity to find the "Miners Extra" brand on a trading card. Cobb shares his 1911 Mecca Double Folds card with a fellow Hall of Fame member — Sam Crawford — who played right field to Cobb's center field for the Tigers. The Mecca set is noteworthy as the first set to ever include player statistics on the back. As far as stats go, Crawford still holds the all-time record for most career triples with 309 and Cobb sits in second place with 295. The third image included here is the result when Cobb's portion of the card is folded over so that it shares the bottom of Crawford's legs. Because folding the card ultimately damages it, finding pristine copies of the Mecca cards is no small task. 1914 Cracker Jack was the first issued by the famous candy popcorn company and the set includes players from both the American and National leagues, as well as the short-lived Federal baseball league. The following year, much of the set was re-issued with some checklist additions and subtractions. Despite this, Cobb is #30 in each set. You can tell the difference between the two sets easily as the 1915 set has the reverse side flipped upside down compared to the front. Yet again, the American Tobacco Company created some of the most beautiful cards available with their 1910-1911 Turkey Red cabinet cards. These cards could be received through the mail by sending in tobacco pack coupons from the Old Mill, Fez, and Turkey Red brands. Cobb's card is by far the most sought-after in the set, holding more than double the value of appearances by Walter Johnson and Christy Mathewson. If you see an authentic tobacco card with a gold border, it is almost certainly a part of the T205 series issued in 1911 by the American Tobacco Company. American League and National League players have slightly different designs in the set with National League cards featuring the first use of a facsimile signature on the card. Cobb's card comes with a whole host of back variations and the Piedmont back is the most common. In total, Ty Cobb has four different cards included in the American Tobacco Company's trading card set issued between 1909-1911. Known to most as simply the T206 set, the four cards are divided into two portrait cards and two action cards. 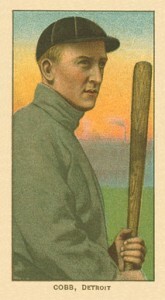 The pair of action cards feature Cobb either holding a bat on his shoulder or off his shoulder. 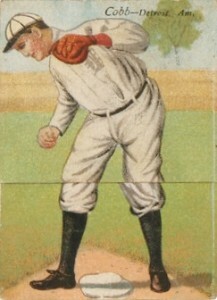 These two cards also help demonstrate Cobb's unique bat grip technique that saw him choke up on the bat with a gap between his hands. Cobb's earliest collectibles can be traced back to the large cabinet cards issued by Sporting Life magazine at the turn of the century. Since the set was produced for such a long time, and new players were added regularly, the overall checklist continues to expand even today as new card examples are found. Cobb's card dates to 1907, just as he was establishing his reputation as the best hitter in baseball thanks to a .350 batting average during that season. 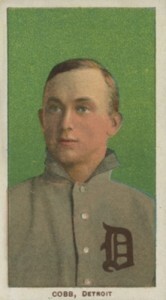 The portrait appearances for Ty Cobb in the T206 series have long been his most valuable cards overall with the green background version being particularly hard to find. The key to the rarity is found in the logos featured on the reverse side and those can include tobacco brands such as Piedmont and Sweet Caporal. Ty Cobb T206 cards have recently been thrust into the spotlight with the discovery of the Lucky 7 Find. This includes seven copies of the extremely rare back variation that, instead of a brand logo, reads, "Ty Cobb King of the Smoking Tobacco World." The Lucky 7 cards are in very good condition after being stored in the pages of a book for many decades. 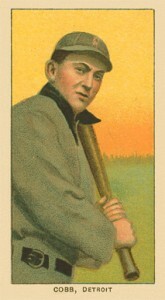 The previously known population of this rare card was about 15 copies and this find significantly changes the landscape of Cobb's most famous and valuable card. 2018 National Treasures Ty Cobb Century Materials Game Used Jersey Patch #3 3! Aside from the fact that the Cracker Jack and Turkey Red should have been higher, how could you leave out the Dietche true rookie, the gorgeous E95 Philadelphia Caramel, AND the E92??? You put in his Goudey Sport Kings??? PLEASE!!! I would have left out the double fold and the 1932 US Caramel and put in the three above. Orly57 � All our writers put considerable time into their work and every collector is different. Narrowing any list to ten means that something has to be removed. Thank you for your suggestions. I think one of his T202 cards would be a good addition to the list, particularly one with the Cobb Steals Third middle panel. Granted that the side panel has essentially the same appearance as the T205 which is on your list, but that photo of him stealing 3rd is THE classic image of Cobb, and on a card from his peak playing days to boot. If it were me I’d replace the Goudey Sports Kings card, which is from after his playing days and has fairly uninspiring artwork on it. 1950 CALLAHAN TY COBB PSA 9 MINT CENTERED! TOUGH & LOW POP! SMR $450!